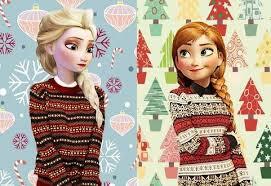 Elsa and Anna on a Sweater. . Wallpaper and background images in the Elsa the Snow reyna club tagged: photo. This Elsa the Snow reyna photo might contain portrait, headshot, and closeup. How Elsa became my paborito movie character.